Because i dont know how to get her out of space ship, i deconstruct the capsule, then i got her again, and now, all her remaining skill reset to 0. Before her skill was 14 + 9 but now all 14 point of her learning come to zero. 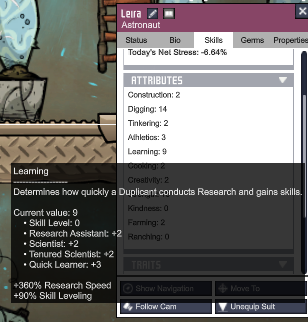 Also she gain no job experiences from doing her space mission. Launch her in space mission, on complete, deconstruct command capsule.